Vocational and trade education is a fast-growing education focus among Idaho high school and college students. Idaho has taken steps to make it easy for students to pursue vocational training with its Pathways in Technology Early College High Schools (P-TECH) program. This program provides the opportunity for students to take vocational courses in high school and graduate with an associate degree. During the 2014-2015 school year, there were 92,128 Idaho students enrolled in vocational and trade programs, up from 90,079 the previous year. Vocational education is an integral part of Idaho’s workforce. 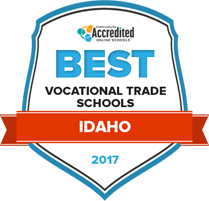 The following guide outlines the role that vocational and trade education plays in Idaho and the career opportunities for graduates. This page provides an overview of the numerous trade and vocational school possibilities in Idaho. Students can attend anything from a community college to a vocational school and study any number of subjects, including healthcare and administrative support, two of several fast growing industries in Idaho. Our ranking of schools in Idaho can make things easier by offering a list based on tuition cost, length of program, financial aid availability, student-teacher ratio and other factors. Students can pursue a variety of two-year associate degrees and post-secondary trade certificates at Eastern Idaho Technical College. There are three areas of concentration: health professions; trades and industry; and business, office and technology. The open-door institution is accredited by the Northwest Commission on Colleges and Universities. Counselors are available to help applicants with things like financial aid, admission procedures and vocational choices. Once admitted, students also receive academic counseling according to their course of study. The institution also offers a comprehensive program designed to help students avoid or overcome problems associated with substance abuse. In order to earn an associate of arts degree or an associate of science degree, students must earn at least 60 semester credits in 100- and 200-level courses while maintaining a GPA of at least 2.0. Since 1950, the school has been accredited by the Northwest Commission on Colleges and Universities. New students are required to meet with an advisor and attend an orientation. Some classes are offered on weekends, and courses begin in the spring, summer and fall. The TRIO Student Support Services program exists to help students successfully complete their course of study at North Idaho College and then transfer to a four-year school. Students can pursue associate degrees and trade certificates in different courses of study across 18 departments. Prospective students can physically tour the campus in a group or individually, or they can take a virtual tour online. All core credits earned at the College of Southern Idaho will transfer smoothly to any of Idaho's four-year universities. Flexible scheduling allows most employed students to keep their current jobs while attending classes. The college promotes a "self-discovery program" that allows students to earn core credits while experimenting with classes from different areas of study. According to the Idaho Department of Labor, 17 of the 20 occupations with the largest amount of vacancies can be filled by trade school graduates. Use the search tool below to find the vocational and trade school programs in Idaho that can help your reach your career goals. In 2014, 98 percent of high school students enrolled in vocational and trade programs graduated. 67 percent of professional-technical education (PTE) students in high school enrolled in college after graduation, while only 53 percent of non-PTE students continued their education. According to the Idaho Division of Professional-Technical Education, there are more than three times as many available jobs for applicants holding a one-year certificate or two-year degree than those with a bachelor’s degree. 61 percent of technical college PTE graduates in Idaho find a job directly related to their studies. In Idaho, there are six major career clusters for vocational education: arts and communications, business management, health sciences, agriculture, food and natural resources, engineering systems and human resources. Students can earn degrees in these industries in high school or in post-secondary technical schools. The following table provides statistics on the certificates and degrees earned by Idaho students compared to the national average. The Idaho Department of Labor projects a 36 percent growth in the state’s healthcare industry by 2022, building on the 46 percent growth experienced in the last ten years. This data suggests that more jobs will become available for professionals in this area including licensed practical nurses, dental hygienists, medical assistants, and diagnostic medical sonographers over the next 10 years. The data below summarizes Idaho’s occupations expected to receive the biggest growth, along with salary information for each. Boise is a hub of opportunity for vocational and trade students, particularly for students interested in medical careers. Carrington College-Boise offers professional-technical education programs in dental assisting, physical therapy technician, registered nursing, healthcare management and clinical assisting. Graduates can find jobs at some of the top employers in Boise, including Saint Luke's Health System, Saint Alphonsus Regional Medical Center, West Valley Medical Center and Idaho Elks Rehabilitation Hospital. Outside of the medical realm, Boise’s top employers center around manufacturing, retail, and education. This translates into promising employment opportunities for graduates of vocational programs related to these fields, including teaching assistants, human resources specialists, and manufacturing specialists. Carrington College-Boise, as well as the city’s other main community colleges, like Brown Mackie College and Stevens-Henager College provide a wealth of programs in these fields and others. This report from the Idaho Professional-Technical Education Department includes information on PTE programs on the secondary and postsecondary levels, including enrollment trends and funding for these programs. The Idaho Department of Labor’s website includes information to help those looking for a job, applying for unemployment, or considering for career training. This agency supports the teachers and administrators that provide career and technical education around the state. This site includes workforce data provided by the City of Boise’s Office of Economic Development.